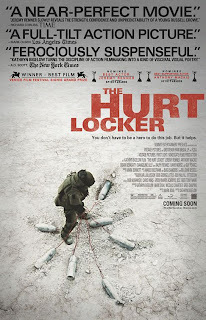 I am completely fascinated by the new movie The Hurt Locker. I've seen it twice now in theaters and think I may go back for a third viewing. As an account of the war in Iraq, it is flawed (as this post by Brandon Friedman at VetVoice makes clear). But as a metaphor for a particular worldview, it's almost perfect. The strangest thing is, I don't even think I share the same view on the war as the filmmaker (Kathryn Bigelow). But what's brilliant about the movie is that Bigelow doesn't examine the big political questions at all. Rather, Bigelow shows us the war through the eyes of the individual soldier and what he sees in the course of doing his job every day. Seeing the wires and the fuses and the bombs and the guys who want to kill us -- through the eyes of a soldier, for two and a half hours, has a profound impact on how one looks at the war I think. I think too often we tend to look at problems top down from a 30,000 foot perspective (to borrow a phrase from David Allen). What The Hurt Locker does is show us the war from the ground up -- where the problem is sometimes just 3 inches away. I'm not gonna say any more than that, other than, if you do see it -- try to see it in a theater with surround sound -- the sound design of this movie is incredible (if you are in SoCal it's worth the $13 bucks to see it at an ArcLight theater). And if you want to chat more about the movie -- please leave me a comment in the comments section.